IT’S OFFICIAL MAJESTIC FEATHERS BIRDING TOURS WILL BE ON SABBATICAL FOR ONE YEAR. NO NEW TOURS WILL BE UNDERTAKEN FROM JULY 20,2018 TO JULY 2019. Majestic Feather’s 2018 July 20 to Aug 8 tour is rapidly approaching. Click on the Colombia link for the full details. 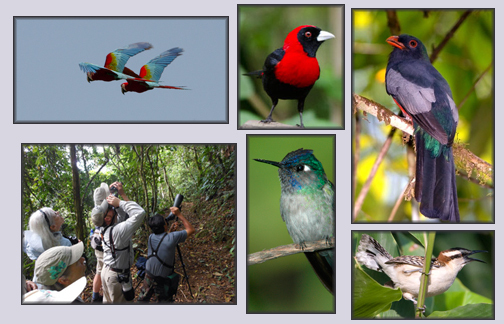 Majestic Feathers offers birding tours to Costa Rica, Panama, Colombia, Peru . We take you to top notch birding areas around the world. We are no longer planning a return tour to Costa Rica in the spring of 2019. To see some information about one of our past specialized tours scroll down the page. Our 2016 Colombia Central Endemics tour was such a success that we decided to formulate a tour for 2018! The Majestic Feathers Northern, Western and Eastern Colombia tour. Main tour: July 20 to Aug 3, 2018 with Post Extension Aug 3 to 8, 2018. There will be loads of endemic birds to this trip! All the details are on the Colombia page. Majestic Feathers tours appeal to the kind of birder that understands that birds are not on your schedule, they are on theirs and if you want to see them you must engage like an adventurer. Tour routes are designed based on life zones, resulting in diverse exciting birding. Our local guides have an intimate knowledge of the habitat and the birds to be found within it. Local guides + local connections = better rates at lodges = an affordable tour price. You will learn about the ecology, natural history, and culture of the country you are touring. Grassroots Advertising (word of mouth and social media networking) = low overhead expenses which also aids in keeping tour prices affordable. The Biggest Advantage! A portion of your tour fee is donated to the Elvira Foundation NGO for forest restoration, watershed protection and eco-education in the La Paz Valley, Costa Rica. Please see our Giving Back Page for more information. Please note that we occasionally utilize the services of travel agencies and this is an exception rather than the rule. 97% of the time we work directly with local in-country connections. Our goal continues to be, to provide our guests with a high quality tour at an affordable price. This Sword-billed Hummingbird was seen on day 2 of the Majestic Feathers® Central Endemics Colombia tour in 2016. The Sword-billed primarily feeds on nectar taken from a variety of brightly colored, small flowers of trees, herbs, shrubs and epiphytes. They favor flowers with the highest sugar content (often red ones that are tubular-shaped.) They are highly aggressive in protecting them. The Sword-billed is the only species of bird in the world with a bill longer than its body! They are found in the montane forests in the Andes of S. America from Venezula to Bolivia. Majestic Feathers® is going to Colombia again in 2017! A MAJESTIC FEATHERS SPECIALIZED TOUR: All These Amazing Birds and Learning to Draw them Too! 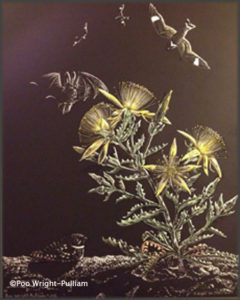 Poo’s scratch board piece, Night on the Moon is on exhibit at the U.S. Botanic Garden Conservatory in Washington D.C.
Poo Wright-Pulliam was Majestic Feathers’ 2014 Costa Rica bird tour Artist-In-Residence and she was the Artist-In-Residence at Craters of the Moon National Monument last summer. 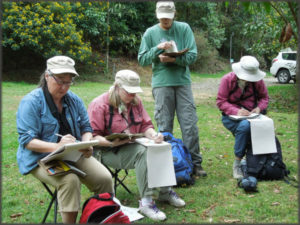 During her residency she spent her days and nights sketching the broad landscapes, birds, wild flowers, mammals and reptiles found in that volcanic wonderland. 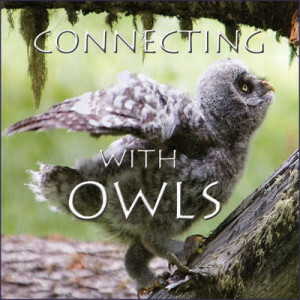 Kathleen’s documentary; Connecting With Owls has had nine screenings in Idaho and Utah in 2014. Thank you for your interest in Kathleen’s documentary film. Explore Majestic Feathers® Adventures and book your tour today!